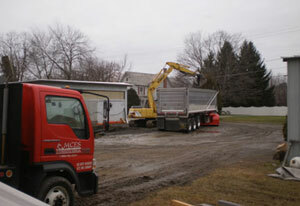 MC Environmental Services, Inc.; tank removal; remediation; air vacuum excavation; upstate New York and Southern Vermont. Larger or more specialized equipment is brought in, as needed, based on your project requirements. Soil removal from hard-to-access locations: With our new, state-of-the art Air Vacuum Excavation System, contaminated soils can be removed from basements; or around footings, sub-surface utilities and piping – more safely and efficiently than ever. Transportation: Using our own dump trucks, or tapping into our network of reliable waste transporters, we’re able to manage the transportation needs of your project – large or small. 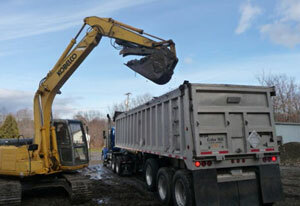 Soil Disposal: MCES can properly dispose of petroleum, metals and PCB-contaminated soils. Disposal options include land-filling and thermal treatment – for either bulk or drum quantities. Groundwater management: We offer a variety of options - liquid vacuum trucks for off-site disposal; frax tanks or tankers for temporary on-site storage; or installation of pump and treat systems – and choose the most cost-effective solution for your project. 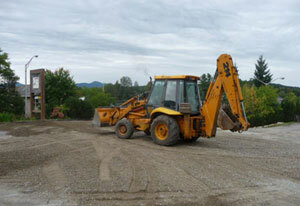 Site Restoration: Installation of backfill, top-soil & seed; compaction; paving – we can do what the job requires. Site Assessments: Soil screening, sample collection and analysis, and site assessment reporting for spill closures can also be provided.